Who will still fail the residence test? Victims of trafficking to the UK who will be made homeless without legal advice. “Today I met a woman who was trafficked to the UK as a domestic servant. She was made homeless & worked as a prostitute to survive. She was granted refugee status & placed in housing, but the local authority wanted to withdraw it. THANKS TO LEGAL AID, I could provide advice to prevent her from becoming homeless again. 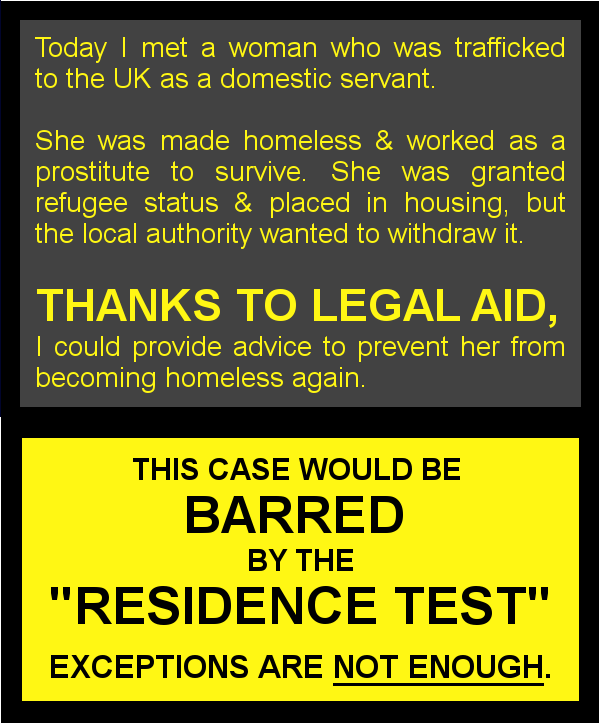 This entry was posted in Cases that will fail the residence test, Housing law, Immigration and asylum and tagged cuts to legal aid, Legal aid, save legal aid, save UK justice by thanks2legalaid. Bookmark the permalink.